RUSH: So I was doing the program yesterday, and this whole business of the FBI and whether or not there was a spy. Trey Gowdy, he’s saying, “Eh, I didn’t see anything here. The FBI and what they did, any citizen would be proud of.” We now learn that Gowdy didn’t even see any documents! He didn’t even see documents. Mollie Hemingway has broken this down fantastically at TheFederalist.com. Gowdy didn’t… There’s something happening. Folks, I don’t know what it is. If you were here yesterday, remember I was torn trying to figure out what Gowdy was doing because I’ve always admired Trey Gowdy, and I’ve only talked to him a couple times. I’ve interviewed him for The Limbaugh Letter. So I can’t say I know him. But I know some people who are very close to him, and they love the guy, and this just seemed like a swerve out of the norm for him. This seemed almost like a 180, and I was just trying to figure it out. You know, what’s going on? And then there’s some other people that are making the same kind of moves, and it got me to thinking. I know the IG report is coming out soon — the inspector general report — and that’s dealing with the Hillary email investigation on how the FBI did or did not botch that. And Comey will be part of that. So there will be things in this IG report that might have an impact on the way people think of the Trump-Russia collusion FBI investigation. But it seems that a lot of people on our — not a lot, but some people on our — side are beginning to circle the wagons to protect the swamp. That’s what it appeared that Gowdy is doing. Gowdy vouched for the FBI yesterday and Tuesday, and it just… Why? You know, what…? It makes me think that something’s on the verge of happening. I have no idea what. But with people circling the wagons to defend the FBI — and that all began, you know, with Clapper saying, “Ah, we’re not spying on Trump. “No, no, no, no! We’re looking for illicit Russian activity in the Trump campaign,” blah, blah, blah. So there’s no doubt that an ongoing effort has intensified to protect the FBI and the leadership of the FBI that’s been involved in all this, which leads me to believe that something very, very damaging may be on the verge of being released. Because the people involved in this inspector general report, the people involved in the Hillary Clinton email investigation, they know what they did. They know what they didn’t do. And they know that any serious investigation is going to discover what they did. So it may be CYA time. But it’s puzzling because, as Andy McCarthy pointed out in his National Review column on this toward the end of last night, for Trey Gowdy to go out and say, “Hey, you know, I think the FBI here performed as any of my citizens would have wanted. I don’t see any evidence here of a spy!” As Andy points out, well, then Gowdy must not have paid any attention to the testimony that was given before his committee! Because Comey and any number of other people have admitted all of this stuff went on in one way or another. And then find out from Mollie Hemingway that Gowdy didn’t even see any documents! Nobody did. The FBI, DOJ still hasn’t shown any of the documents Devin Nunes wants to see. So here is what the president tweeted, and he saw it last night on Hannity on the Fox News Channel. Hannity started off a segment by playing this sound bite from my program yesterday, audio sound bite No. 2, Friday. Are you ready with that? Three, two, one. 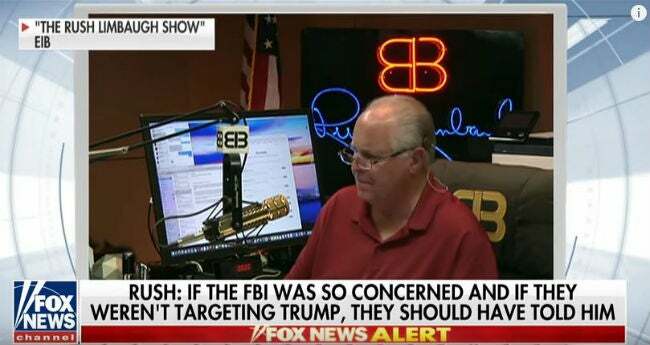 RUSH ARCHIVE: If the FBI was so concerned, and if they weren’t targeting Trump, they should have told Trump! If they’re really concerned about the Russians infiltrating a campaign, then why not try to stop it? Why not tell Trump? Well, the answer’s perfectly clear, to me. They were running this whole story! They were pushing this scam! They said they’re trying to protect Trump, right? The Washington Post, the New York Times, Clapper, say they were trying to protect Trump. Well, this is not very good protection if they think there’s a spy in there or that the Russians have infiltrated the campaign, if they’re trying to protect Trump, why not tell him? They should have told him. And if they’re really concerned about the Russians infiltrating a campaign, which Trump writes is a “hoax,” and it is, then why not try to stop it? If they know this is going on and if they’ve known it for a while, why not try to stop this? They made no effort to, and the reason is because they’re pushing this. This whole thing is manufactured. Do you realize what’s happening, folks? The entire premise of the past year and a half — the whole premise of the Mueller investigation, which is the Russians and Trump colluded — has phone call apart. There isn’t anything there. These people are having to rewrite their narrative! They’re having to come up with a brand-new scenario because the thing that was gonna get rid of Trump has bombed out on ’em. And I think this is another reason why so many of them are discombobulated. RUSH: Here’s Rudy. Grab sound bite No. 3. 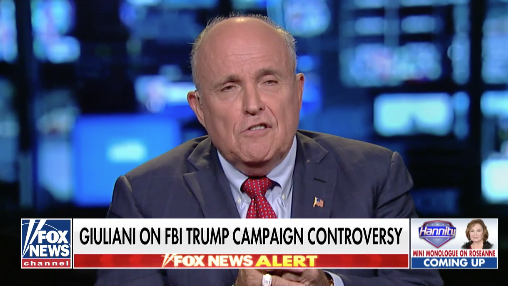 Rudy was on Hannity last night, and after they played the sound bite of me you just heard where I talk about the FBI being so concerned — and if they weren’t targeting Trump, they should have told him — Hannity said, “The bulk of this was Hillary Clinton bought-and-paid-for foreign intelligence that built a bunch of Russian lies. That’s the Russian collusion., and they go out and they never corroborate it,” and here’s Rudy’s reaction. GIULIANI: I’ll follow up on what Rush said. Of course, if it wasn’t spying they should have come to the Trump campaign. They could have come to me. My goodness, I was the FBI Man of the Year that year! (chuckling) They could have come to me and they could have told me, and I could have briefed the president or they could have briefed the president. RUSH: That’s the point. If they were really concerned about protecting Trump — as the New York Times says and the Washington Post says — and if they really had a whiff of evidence — which they don’t — that the Russians had an informant (’cause they put the informant in there), then the sensible thing to do would have been to tell Trump and alert him to it, particularly if he wasn’t being targeted. Now, the Drive-Bys are beside themselves that Trump is quoting me today. That’s the next thing that’s fun. In fact, there’s a fascinating story coming up about the spy. And I think there’s more than one. And by the way, “spy,” “informant” may not be the accurate term for what this guy was doing, but for our purposes we’ll use “spy” and “informant.” They’re interchangeable depending on whose ox is being gored here. But his name is Stefan Halper, and the guy has, as it turns out, overwhelming contact with the media! And not to be surprised about this, but the media, as you and I know, are not just innocent bystanders here watching what’s going on and then telling everybody about it. No, that’s what journalism is. Journalism is where you find things out that people don’t know, and you report them, and then you tell people. That’s not what journalism is anymore. Journalism has become activism, and it’s radical activism, and it could well be that they were — well, we know they’re in on it. I mean, they’re in on it from the standpoint of accepting leaks from anonymous sources. There’s another one today! There is another story about McCabe and Comey and so forth, and the New York Times has three writers, and they’re writing a story, and they have never seen the document that’s being reported on. All they have is another anonymous source telling them what the document said, in this case a letter that McCabe wrote or a memo. But they haven’t seen it! Just like everything else in this story, they have never seen whatever has been leaked to them because it’s all been made up! That year-and-a-half where former government, current government intelligence sources, anonymous sources tell the New York Times that blah, blah, blah. Anonymous sources, no sources, and no evidence. And they’re still doing it at the New York Times. Three reporters reporting on something not one of them has seen. But they’re reporting on it as gospel. And accepting that it’s gospel from an anonymous source. Trump is blowing up so much of the left that it’s hard to calculate it. And in some people’s case, it’s hard to believe it, because it’s difficult to imagine these people being snookered or losing or being outsmarted. But I actually think it’s happening in a lot of ways. And of course we’re never gonna get the satisfaction of having that reported. The media is not gonna get down and dirty on stories “how Trump embarrassed us, how Trump made fools of us.” That’s never gonna happen. But I think it is. But if this spy, Stefan Halper, has multi, multi-contacts with media, it could well mean that the media was in on the Halper aspect of this as they were in on the Steele dossier and as they were in on promoting all of these nonexistent leaks for the first year-and-a-half. Anyway, Trump tweets out what I said yesterday. And the fascinating thing is the Drive-Bys have gone crazy today that Trump is quoting me! TheHill.com has a long story — well, it’sit’s halfway decent lengthy story about, “Oh, my God. Oh, my God. Trump is quoting right-wing radio host Rush Limbaugh.” The UKDaily Mail has a long story with a lot of photos, including still shot clips of me from the Hannity TV show last night. That’s what I showed you, Snerdley, all because the president is quoting me. Now, if I were your average insecure scaredy cat, I would say, “Wow. They must really hate me. They must really think I’m a dork. They must really think I’m a nerd. They must really think that I’m an idiot if they’re worried the president’s quoting me.” But that’s not what it is. These people have known me for 30 years. They’ve tried to categorize and characterize me as some fringe wacko figure. But they know that’s not the case. They know this is the most listened radio talk shows in the media. This is one of the largest media audiences in the country, and they know that I make sense and they know that you believe I make sense. And now with Trump tweeting out quotes of me, that worries them. They’re trying to make it look like, “Oh, my God. This is great! Trump’s now quoting some fool, some wacko.” But that’s not what’s going on. They are concerned, and they’re trying to impugn me and Trump. But they give themselves away. Here’s an audio example. This is a news station in New York City just this morning. Audio sound bite No. 4. Here we go. 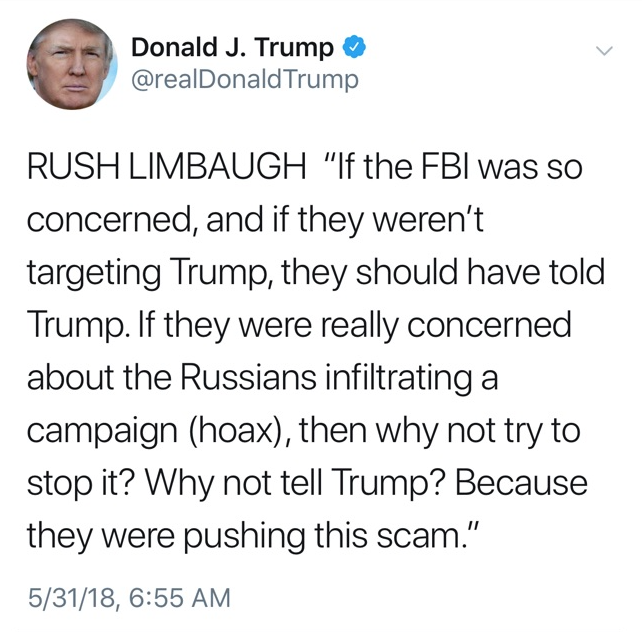 MAN: The president’s tweeting on the topic this morning, quoting Rush Limbaugh in his tweet, quote, “Who said the FBI was so concerned and if they weren’t targeting Trump, they should have told Trump? If they were really concerned about the Russians infiltrating a campaign, folks, then why not try to stop it? Why not tell Trump?” The president tweeting that this morning. RUSH: That’s pretty straightforward. But you can hear in the voice, “Rush Limbaugh?” Now, some of them think after all these years they should have gotten rid of me or be rid of me. But they’re very, very concerned because it’s the exact opposite. RUSH: Apparently, I misspoke. I said The Daily Caller did a story — a big, long story — on the president tweeting me. The Daily Mail, U.K. Daily Mail, not Daily Caller.